Today we do the sightseeing in the city center. We will see the historic Tiananmen Square and the majestic Forbidden City imperial palace; feel the old city life in Hutongs with a local family visit and an exciting rickshaw trip. In the Pearl factory appreciate the pearl making process and buy some as souvenirs if you like. Great Wall sightseeing as well as Ming Tomb exploration today. Badaling Great Wall is the most popular section of Great Wall; the Changling of Ming Tomb and Sacred Way represent the tomb design culture for emperors. Besides, you also have the oppotunity to learn Chinese pocerlain culture in the Cloisonne factory. Morning tour starts in the beautiful Summer Palace, an imperial garden as the entertainment resort of emperors and their family (a lake cruise included). After lunch, be driven to airport and fly to Xian. Upon arrival, be picked up and transferred to the hotel. Fly to Chongqing after breakfast; be picked up at the airport and drive to Ciqikou Old Town, which features unaltered wooden houses and narrow streets, offering a glimpse of the peaceful life in Sichuan countryside. After lunch, go to see cute pandas in Chongqing Zoo and then be transferred to board the ship for a Yangtze River Cruise. 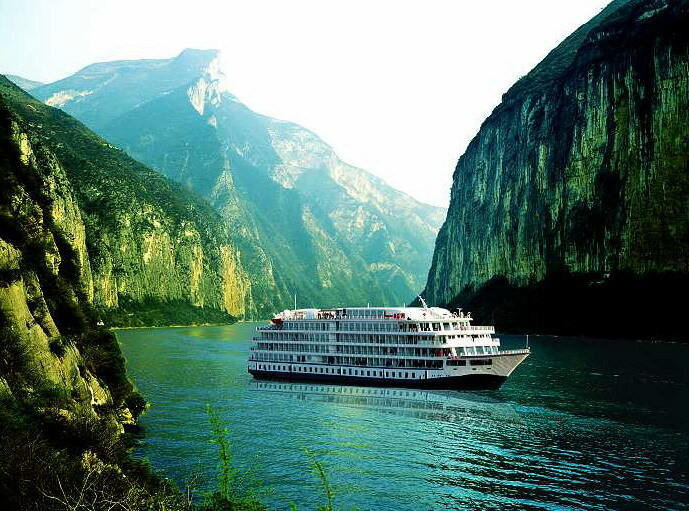 During the amazing cruise, you will have a shore excursion to the Fengdu Ghost City, a well-known town for its special culture of ghosts and the afterlife, and a good place to learn about Chinese ghost culture. Take a small boat to the Shennong Stream in the afternoon during the cruise. Drifting along the it, you will see around the steep ridges, peaks, clear water, thick vegetation, wild flowrs, flying birds, ancient hanging coffins as well as hear the local sweet songs. In the evening, the cruise holds various activities and cultural performances, such as costume shows, Sichuan Opera and Mask changing. The Three Gorges Dam is a key attraction of this Yangtze River Trip. Tourists can get access to the top of the dam and enjoy photos. The cruise end in Yichang at 1pm. Be transferred to airport and take the flight to Shanghai; be met by the guide at Shanghai airport and driven to hotel. Take our eye on this modern metropolis. You will be very exited to stand at the observation deck of the Oriental Pearl TV Tower at 468 m high; the city view is stunning. Shanghai Museum is the fast way to learn about Shanghai’s history and culture. Yuyuan Garden is a typical south China classical garden, by its pavillions, small bridges, pools, etc. The Bund is impressive for the group buildings by different countries in the city’s colonial period. Nanjing Road is a world-noted pedestrian shopping street for fasion lovers. *Single room supplyment only applies to hotel; for a single cabin in the ship please contact us to check cost.